The Royal Memorial Gates stand at the Church Street entrance to the grounds and were erected in 1918 by the congregation as a memorial to men and women who volunteered for service in World War One. The pillars of the gates serve as a roll of honour and include the memorial's dedication on 23 March 1918. The stonework over the gateway displays the Royal Arms, permission for this being granted by King George V in November 1917. 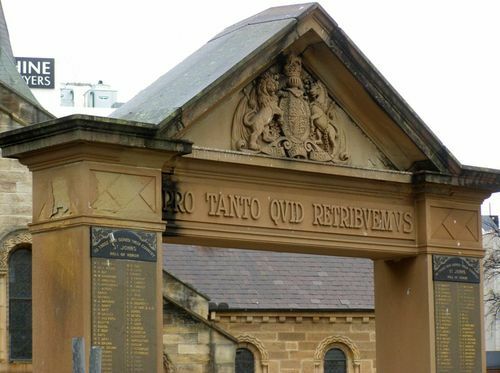 On Saturday afternoon his Excellency the Governor General visited Parramatta for the purpose of attending the service of dedication of the gate (to be known as the Royal Gate), and the unveiling of the roll of honour inscribed thereon, at the entrance to St. John's Church. On arrival his Excellency was met by the rector and wardens and the Mayor and aldermen, and welcomed to the town, after which his Excellency inspected the guard of honour, which consisted of returned soldiers from Parramatta. The religious service of dedication was conducted by the rector, the Rev. S. M. Johstone. His Excellency unveiled the honour roIl. The Sydney Morning Herald (NSW), 25 March 1918. Sir RONALD C. MUNRO FERGUSON P.C., G.C.M.G., K.C.V.O.